I barely knew my paternal grandmother, but through my father’s cooking I have always felt a connection to her. I have a blurry black and white photo of her whisking something or other that I hang in my kitchen wherever I go. And growing up my father’s go-to cookbook was always her tattered copy of The Art of Italian Cooking by Maria Lo Pinto. Published in 1950, this cookbook is now out of print but you can find copies around (now everyone in my family has one; mine was a wedding present from my aunt, and is now one of my most cherished possessions). Although Grandma Barbara was Hungarian, her husband, my Grandpa Angelo, was Italian. And so Italian classics were pulled from Lo Pinto’s simple and easy to follow guide and incorporated into her existing repertoire of goulash, paprikash and schnitzel. It is this combination of Hungarian and Italian, Eastern and Western European (with more emphasis on the Italian) that I grew up with and find most comforting. Although I’ve made spaghetti and meatballs countless times, this time I decided to follow Lo Pinto’s recipe to a T, and I was happy I did. With the addition of soaked stale bread instead of dry breadcrumbs, the polpette were moist and tender. 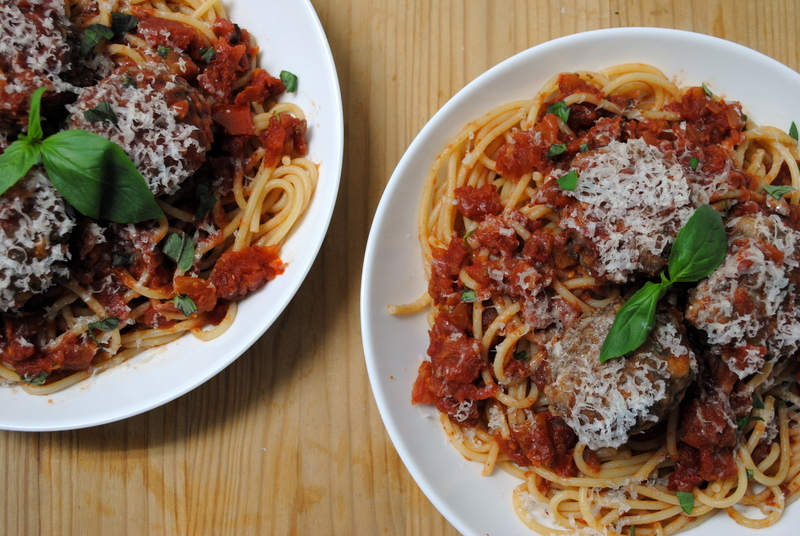 And the generous addition of Parmesan, garlic and parsley makes the meatballs incredibly flavorful on their own, suitable to eat by themselves. While I usually sear the meatballs and finish cooking them in tomato sauce, this time I cooked them through by themselves in the pan, until they had a nice crust. I spooned some tomato sauce over to keep them moist and give them additional flavor, and served the ultimate Italian-American way, with spaghetti and marinara sauce. Mangia! Soak bread in water 5 minutes; squeeze dry. Mix thoroughly with meat, grated Romano cheese, garlic, and parsley. Add the eggs a little at a time until the texture is right (very moist, but not too wet). Add salt and pepper to taste. 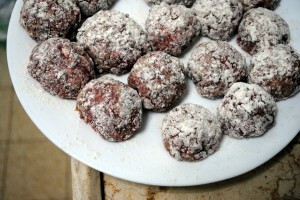 Shape into balls about the size of a small egg; roll in flour. Fry in hot oil 10 minutes or until golden brown. Oh wow. Thank you so much for commenting! It seems that you come from a family of incredibly talented cooks. The Art of Italian Cooking is a treasured book in my family – everyone has a copy. My father has his mother’s tattered copy as well as a new one, but he still cooks out of the old one. I love how simple and straightforward the recipes are, and how relevant they remain today. 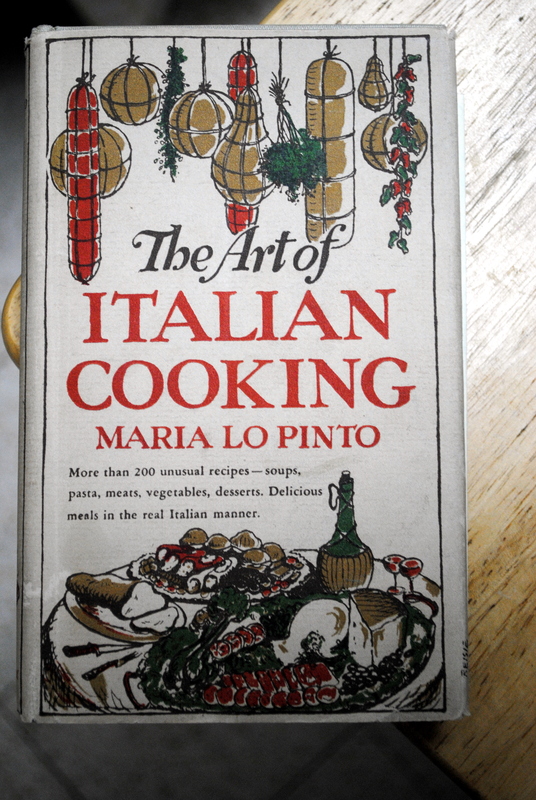 I didn’t realize that Maria Lo Pinto wrote four cookbooks – I will have to track down the other three! Thank you to your family for inspiring mine! My mom had a copy of the original book. It was tattered from use and did not have a dust jacket! It has been lost so I purchased a copy and I dont know how to tell if the dust jacket is original or not. But the cover is black with spaghetti and vegetables and red wine to right. So Im thinking that the book may be 1st issue but the cover is from later date. It is not the picture that is on this blog. I wonder if you have any information that would be helpful to me. This cookbook was the cooking Bible in my Italian mother’s home. It was the first and only thing I asked for from my Italian mom when I decided to elope. I still have my cookbook, but it is well-worn and I think it was from the 50’s. That’s so lovely. My father’s copy is well worn from the 50s as well. My mom even got him a new one at some point, but he always reaches for the sauce-stained one with pages falling out. Yogi, Maria was my Dad’s cousin as well. The family name was Stropole, Staropoli . Yogi, My mother had the original hardcover. Our ancestry is in Marineo. I met a few LoPinto when I was in Marineo, and I met a few in the Garfield/Lodi area of NJ. I have Mom’s cookbook, and I treasure it. I, too, have a very old, tattered copy of this book (the pages are falling out and apart). It is a paperback, but I love it. The recipes are simple and I like the holiday menus in the beginning. Isn’t that the best? My father’s copy is quite old and tattered as well since it’s the one his mother used to cook from. He has a new one that my mother managed to find for him years ago but he still uses the tattered one. Love it. Isn’t it amazing how food brings generations of people together? I love your story. 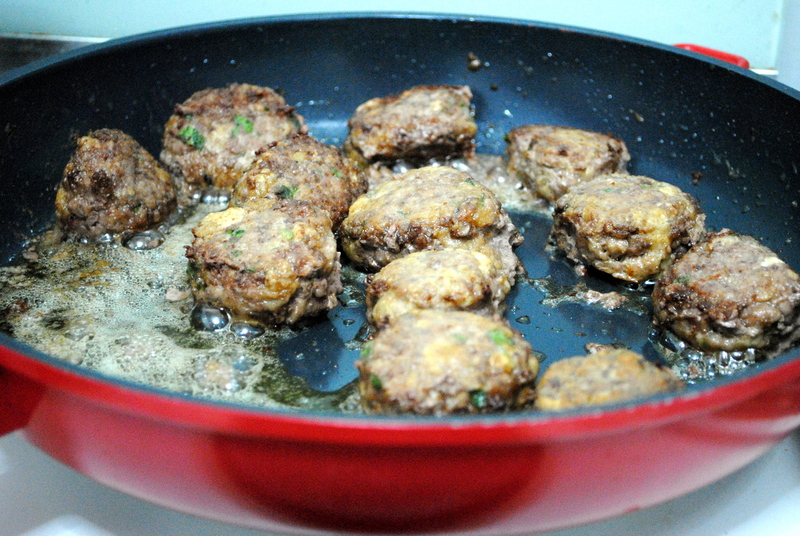 And these meat balls look delicious. Hmm… I’m thinking meat ball sandwich! It really is incredible! Thank you Sandy! So glad to be included in the Foodie Crush round-up with you 🙂 Oooh meatball subs would be amazing with these! Maria LoPinto was also a relative of mine. Not sure how though. Maria had given my mom a signed hardcover copy back in 1948. I did not know she was an attorney. I have gotten copies on eBay to give to my daughter-in-laws. I grew up in the Bensonhurst section of Brooklyn. It’s Nice to read so many people are still enjoying her cookbooks. I love hearing about all the Maria LoPinto connections! It’s wonderful. Thank you so much for your note! My mother always used this book. She’s not Italian, but between this book and her Sicilian mother in law she learned! We’re on our second copy of the paperback, which is falling apart, and we’ll never give,it up. Mom brought it out today to make stuffed artichokes. Love it! Thank you for sharing your story. I love hearing everyone’s connection with this wonderful book that also holds such a special place in my family. Maria Lopinto was my Grandma, Sophie Christie’s sister. She taught me how to play Solitaire in the Dyker Heights, Brooklyn home that she shared with my Grandma. She also taught me how to play piano at her summer home in Kingston, NY. She was a woman of many talents beside her superb cooking! One of her other books, Eat Honey & Live Longer, was way ahead of her time. She knew the benefits of honey, 60 yrs before science. It is amazing to stumble upon everyone talking about my Great Aunt Marie! She was a woman of many talents, and had four sisters. She was one of the first women in NY to cook on TV. I just looked up Maria Lo Pinto on my iPad what a wonderful storie you have about you and your Father. I found sometime ago a signed 1st edition of her book the Art of making Italian desserts 1952. I love any kind of cook book so when I spotted this in my local Salvation Army store I knew I had scored big time. I just love the stories of her Auntie Gioias kitchen oh to have seen it or even cooked in it. Thanks for the memories . Thanks for the note Fran! I will have to keep an eye out for her other books – I didn’t even know she had others! I have my mother’s 1948 version and would like to get another copy of the book. Is the current printing the same as the original 1948 version? Thanks! Great question – I don’t think it’s the same edition, but I do believe they’re the same or at least very similar… I’m sure you can find a first edition somewhere. Love reading the posts from over the years. My mother grew up in Brooklyn, NY and was given this book for a wedding gift. My mother’s side is Sicilian, my father’s family from Sorrento. My mother said these recipes were much like my Sicilian grandmothers cooking. I have a 1948 publication held together with duct tape. As a kid I always love reading about the holiday menus.. very reminiscent of how we celebrated in our house . 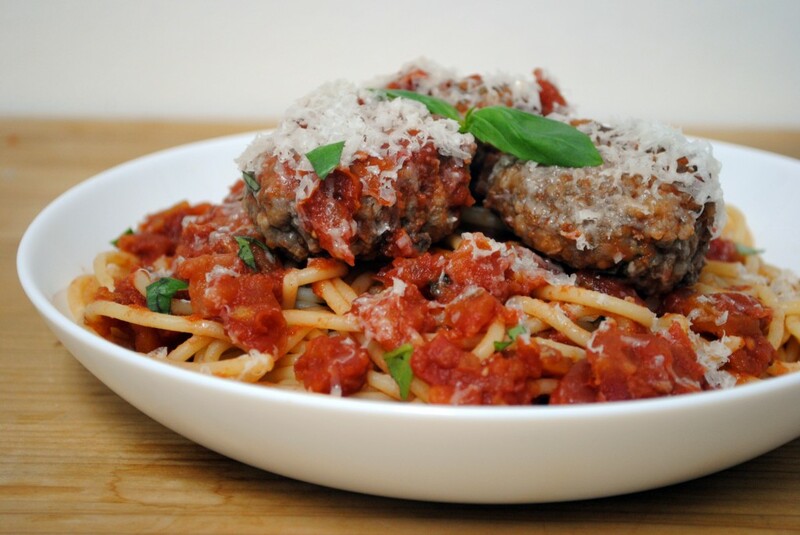 BTW the meat ball recipe is pretty much how my grandmother & mom made their meatloaf..using lots of Romano .